Update: Some of the issues I brought up here, with regard to launching missions in a certain order, being forced to launch supply craft first, etc. were fixed via a patch about a month after release. You can see a video featuring the game and those changes using this link. Carrier Deck tasks the player not with directly fighting the battles of a modern naval warfare scenario, but with managing the logistics of a very busy flight deck. Developed by Every Single Soldier and published by Slitherine/Matrix Games, Carrier Deck falls more on the lighter end of the gaming spectrum than what you might normally expect from those names. Unlike the turn-based Afghanistan '11, Every Single Soldier's other recent release, which focused on long term planning and carefully considered logistics, Carrier Deck requires the player to constantly shift their focus from moment to moment as each new threat pops up. Carrier Deck gives you a bird's eye view of the titular carrier deck, from which you click on the various aircraft to select them, then either click to send them to a different parking spot, or select what sort of mission you want the aircraft to be prepped for. You will be doing a lot of clicking, so make sure to warm up that clicker finger ahead of time. It's not quite Starcraft 2, but once a mission starts, don't expect to take a break until it ends. Each of the scenarios only lasts 10-15 minutes, but will demand your complete attention from beginning to end. The gameplay revolves around two areas of the screen. The actual flight deck and aircraft, rendered in modest but clear 3D graphics where you will be dealing with the units directly, and the bottom half of the screen where you will see everything that is happening out in the field. Threats will approach in four differently colored channels, representing air, surface, undersea, and land-based enemies. The enemy units approach from the right, and if they reach the left side, they will deal damage to your carrier. Your first problem is that the carrier group has a very short detection range into all the channels other than the land units. To extend your vision, thereby giving you more time to counter a threat, you will need to send aircraft out on reconnaissance missions. Dedicated recon units like the S-3 Viking offer better vision and longer loiter times, but are usually in short supply. In a pinch you can send out the workhorse F-18 Hornets as scouts, but will want to send something better as soon as it becomes available. Helicopters also occupy parts of your deck, specifically Seahawks and Chinooks. Once a threat appears in one of the channels, you will need to ready an appropriate aircraft to deal with it, queue up the mission, then launch the unit. The actual combat is not your concern, and will always be successful. That all sounds simple enough, if you only needed to deal with one thing at a time. In reality, you will be dealing with many things at once, all the time. Carrier Deck is a bit like learning to juggle, and just as you get a handle on juggling three balls, someone throws in a fourth, then a fifth, a sixth, and so on. As you are sending units out on missions, others are coming back in to land. These returning craft need to be moved out of the way, then re-armed for another go. To complicate matters, units can sometimes return with damage, necessitating a trip below deck on one of the elevators, then back up. In addition to that, new units and supply transports often arrive mid-mission and must be worked into your current rotation. 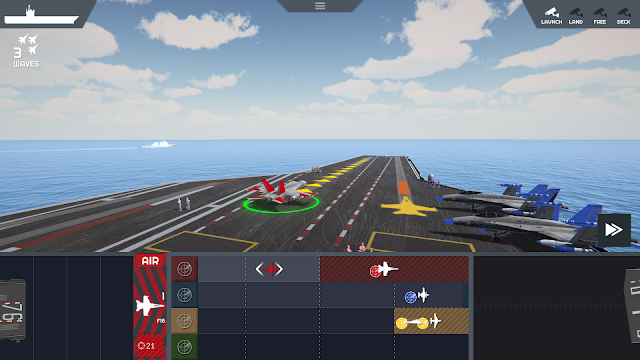 Tougher enemies must be hit by multiple aircraft, and occasionally a really tough enemy will require two different mission types to be flown in sequence. Needless to say, there are a lot of plates spinning all the time. One thing I'm not crazy about is how the missions which are queued up must be launch in the order you created them, even if you have aircraft ready to launch for the second or third mission in line. This often seems pointless, since you can just cancel a less pressing mission then recreate it an instant later. To add to this frustration, the supply craft, which arrive periodically, take absolute precedence over all other missions by default. Even if an enemy destroyer is about to strike in a matter of seconds, and you have fighters primed and waiting on the catapults, you have to wait for that cargo plane to refuel, waltz over to the runway, and then take off before you can launch any other aircraft. I don't really understand the logic of this, other than making things more difficult. To assist you with sorting through this multi-tasking challenge is the well thought out UI. The bottom half of the screen, with the various channels and sections showing queued missions and returning aircraft, tells you everything you need to know about the situation at a glance. To make mission tasking clear, everything is color coded. Air missions are red, surface is blue, submarine is yellow, etc. The aircraft themselves are highlighted in bright colors to indicate what mission they have been equipped for, matching the icons on the information screen below. Clicking on an aircraft shows all of the locations on the deck it can be moved to, holding down the mouse displays a radial menu with all of the missions it can be equipped for, again with clear color coding. The game comes with a linear campaign consisting of a few dozen missions of increasing difficulty and complexity. Each outing throws a different combination of enemy and friendly forces at you, though the core gameplay loop remains mostly the same. You are scored based on how much damage the carrier takes and how many aircraft are lost (usually due to collisions on the deck). Simply surviving the mission will unlock the next one, but you can get some replayability out of returning to try for a perfect score when you fall short. Playing through the entire campaign will only take a few hours, as each mission can be completed in a matter of minutes. Perfectionists will need more time though, as getting five stars on every mission will inevitably require multiple attempts at the more difficult scenarios. Additionally, there is a quick play mode which is basically more of the same at your chosen difficulty level, and a survival mode where the game will keep getting more and more difficult until you are overwhelmed. Whether you play these modes will depend on just how much more of the game you want after finishing the campaign. As mentioned, the graphics in Carrier Deck are not that spectacular, but it looks decent enough considering the price point. The various aircraft are nicely modeled and easy to distinguish from one another. The camera can be moved around to get a closer look at everything, but you will rarely have time to be ogling those Super Hornets. The radio chatter was done particularly well, with the aircraft reporting in using all sorts of squadron names. Between aircraft launching, requesting clearance to land, and enemy units being spotted, the radio keeps you informed and adds a bit to the immersion factor. 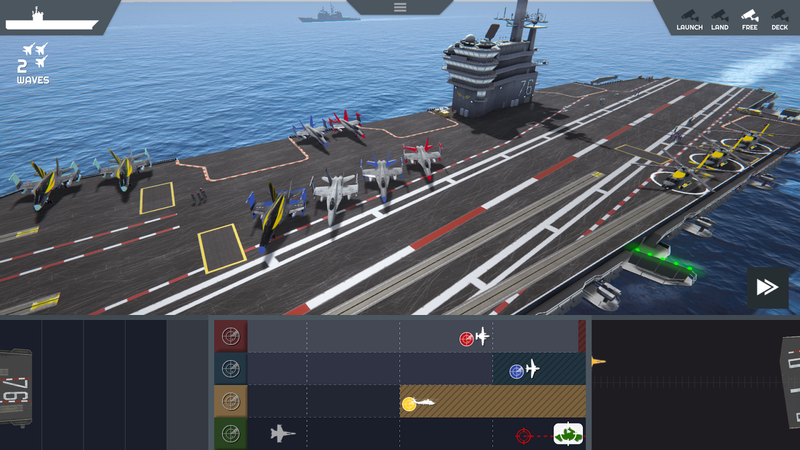 I didn't experience any major bugs while playing Carrier Deck, though I did have a couple of minor happenings such as an aircraft not changing to the correct color a few times, linked to changing its mission assignment multiple types in rapid succession. More annoyingly, I had to unplug my joystick and throttle from the computer, because the game was apparently pulling input data from one of them, which caused the camera to slide to one side and stick there. The game has already received a couple of patches, so I'm sure any other minor issues will be buffed out in short order. I enjoyed my time with Carrier Deck, and appreciate it for being something completely different. 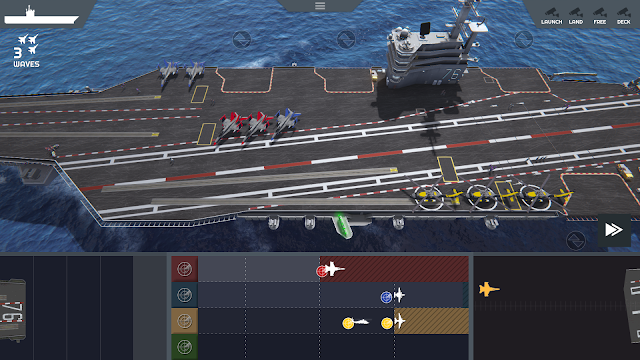 This is not a detailed simulation of carrier operations, or really a wargame. It is a fast-paced management game with a war theme. Priced at only $10, you will easily get your money's worth of entertainment with one trip through the campaign. 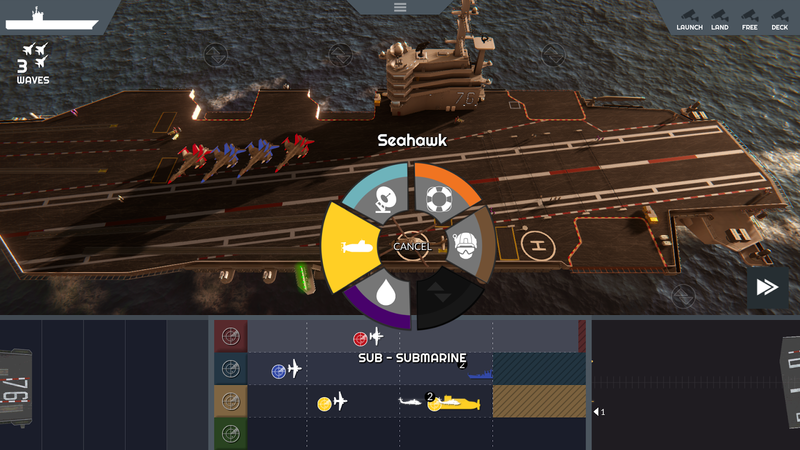 Carrier Deck is available directly from Matrix/Slitherine and is also on Steam. Good to hear the patch will take care of the two most pressing issues.